Days 3 and 4 may be found here. I awake in the wee hours, and brrrr. It gets quite cold this far north in mid-August. I decide to have a strong bladder and snooze a little longer. Up just before sunrise. I cook the usual camp breakfast and prepare to head back into Yellowstone. The camera concerns me. I have been recharging my cell phone off the car adapter, and calling Cindy every night to report that I’m doing fine and to see how she’s doing. Alas, when I plug my camera into the adapter, the charging light does not come on. I can’t figure it. It’s the same USB cable I use for both at home; I plug it into the same wall outlet adapter for both at home; both charge just fine. Do not understand. And I’m going through battery packs one per day, I have three, and I have over a week before I’m back at Mom’s and can recharge from her outlets. Perhaps I can find an outlet here somewhere that someone will let me use. (Does quick mental calculation.) It costs less than a penny’s worth of electrical power to fully recharge a lithium battery pack. So it’s a matter of tying up an outlet for a couple of hours, not of the cost of the electricity. Sawtell Peak, just north of Island Park. 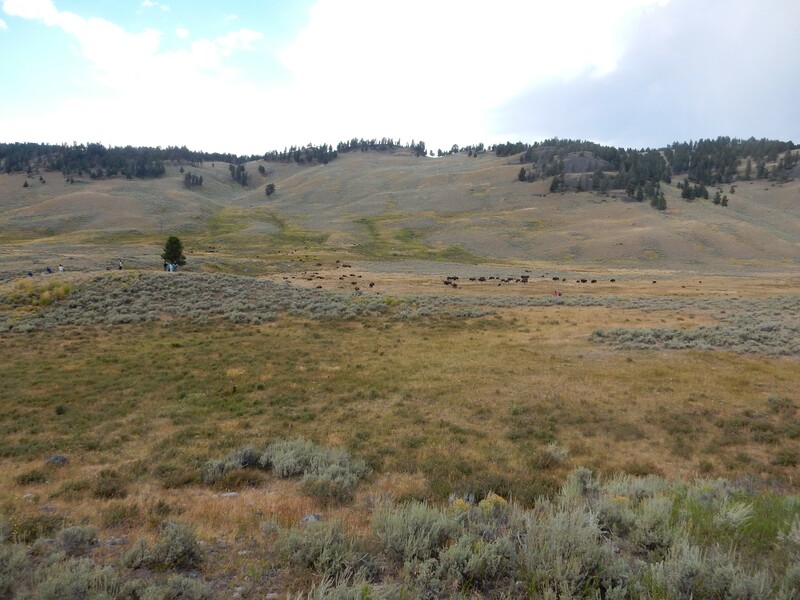 Part of the Centennial Mountains, a very young range which, judging from its unusual east-west orientation, was probably thrown up by the passage of the Yellowstone hot spot rather than Basin and Range tectonic extension. 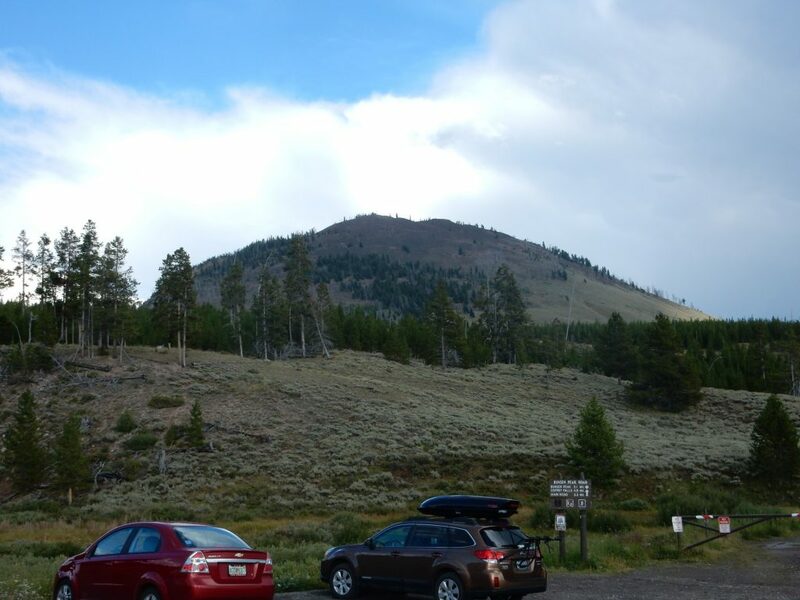 I drive into the park, headed for Mount Washburn, which I mean to climb today. I can’t resist stopping at Terrace Spring, though, which is just off the road from Madison Junction to Canyon Village. I am severely limiting my camera use until I’m sure I have a way to recharge, but I can’t resist one picture. 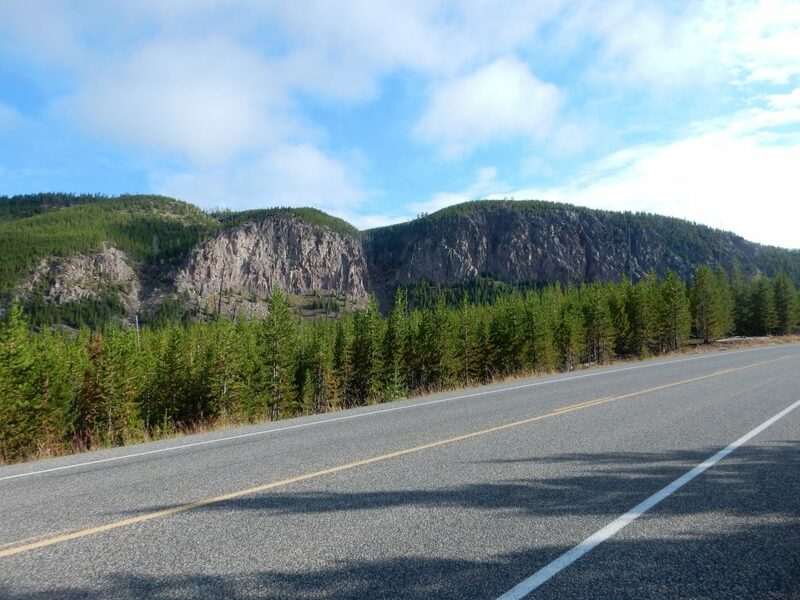 Further down the road, the Tuff Cliffs. Oddly, the Lava Creek tuff here is not welded, meaning the ash was already solidified when it was deposited. This suggest an air-fall ash, and geologists speculate this was very close to the early source vents for the Yellowstone eruption and the air fall ash piled up here. 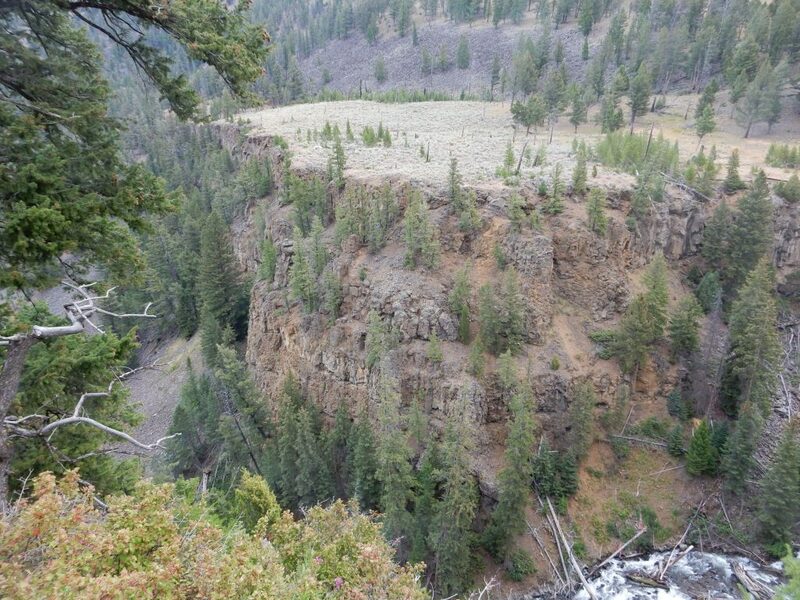 This marks part of the north rim of the caldera. 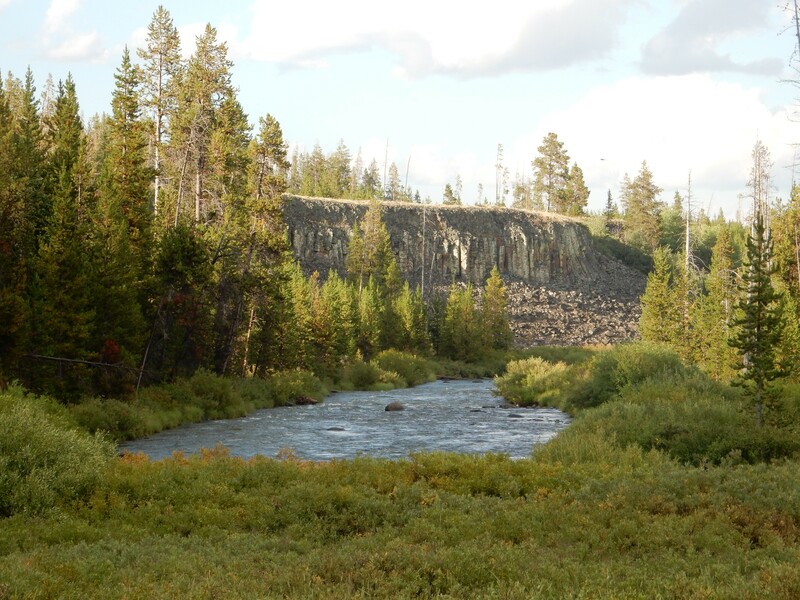 Here the Gibbon River cuts through the north caldera rim. A particularly resistant bed of Lava Creek Tuff forms the lip of the waterfall. I’ve never seen a name for these cliffs, but I found them striking. This is another section of the north rim of the caldera. I allow myself to be diverted to the Artist Paint Pots. Here a vent is far enough above the water table that the water supply is limited, so the mud formed by acid fumes attacking the surrounding rock doesn’t get flushed away efficiently. It bubbles instead. It’s late in the summer, so the mud is particularly thick and gooey right now. I haven’t digitally manipulated this picture in any way. I think it may be my Ansel Adams moment for this trip. You can’t plan photographs like this; at least, I can’t. They just happen. 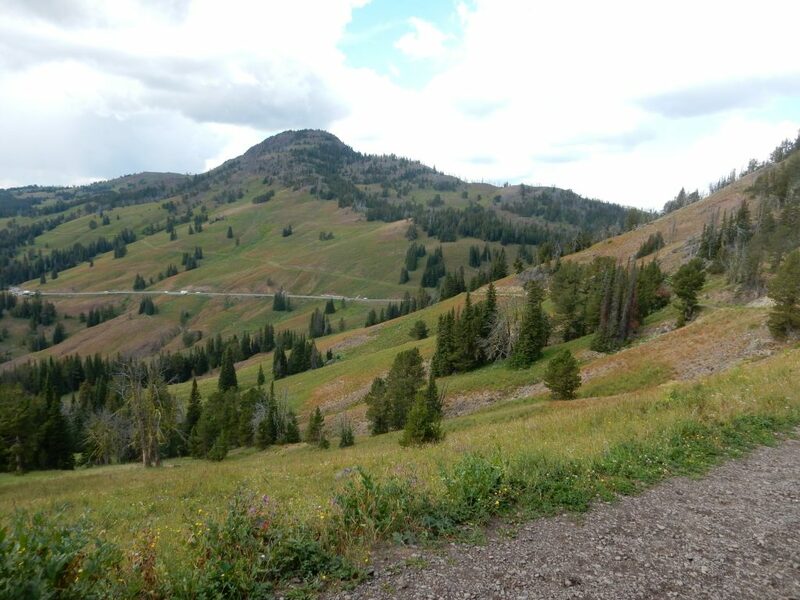 Continuing on, I pass Norris Geyser Basin (I’ll be back) and reach Dunraven Pass. The parking lot is very full; good. I won’t be alone on the trail. I don backpack, load water bottles and trail lunch, grab my stick, and start out. I find that tourists are rather strung out along the trail. I find myself behind what appears to be a couple of blonde college-age girls. Feeling a bit awkward, I pace myself to stay about a hundred yards behind them on the trail — far enough that they won’t feel like I’m stalking them, close enough that they can at least hear my death rattle if a bear ambushes me. There are some lovely wildflowers along the trail. These were especially common. Wild delphiniums of some kind, perhaps? 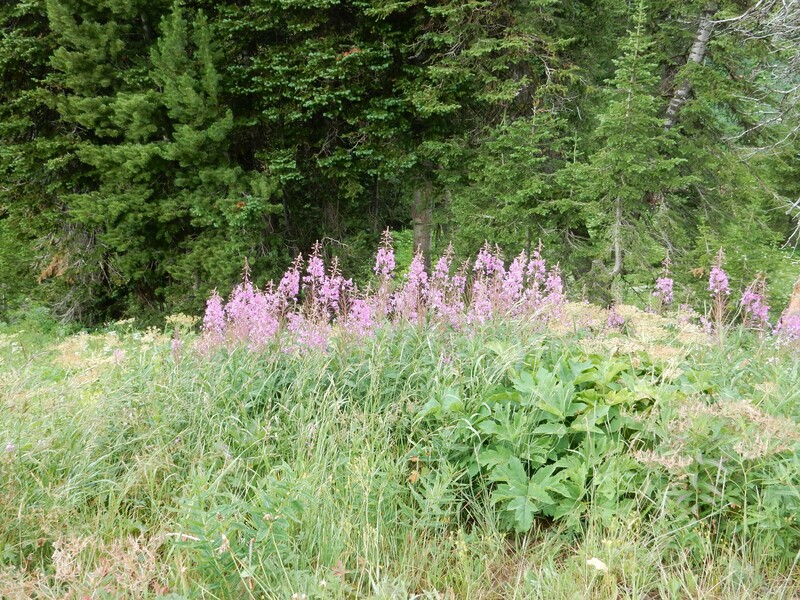 Consulting the guide book afterwards, I find that they are probably fireweed, Chamerion angustifolium. It’s part of the evening primrose family. 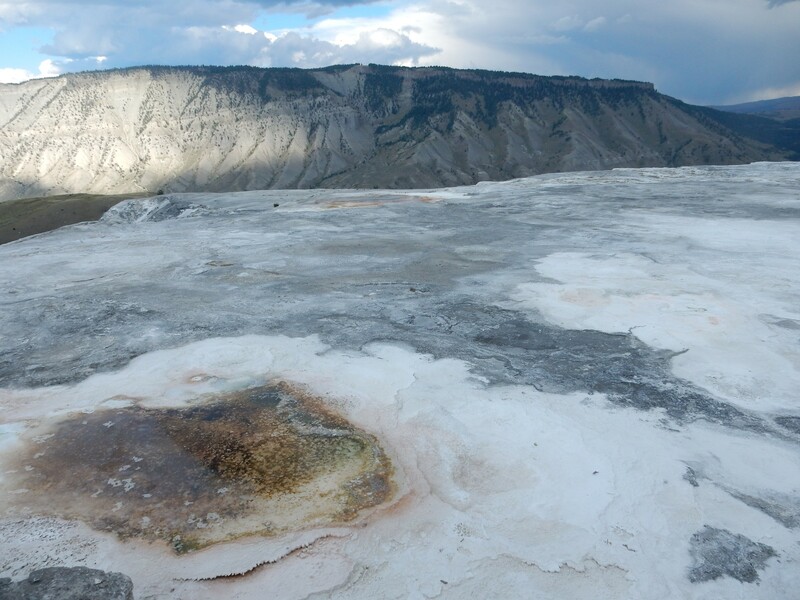 Mount Washburn, like much of the north and east caldera rim, is composed of Eocene fanglomerates of the Lamar River Formation. These are part of the Absaroka Volcanic Supergroup, representing a much older period of volcanic activity than the Yellowstone caldera. These rocks were laid down 50 million years ago as part of a massive chain of volcanoes resembling today’s Andes or Cascade Range. Here‘s a nice outcropping. This looks like a debris flow deposit — angular bits of rock in a muddy matrix, since indurated (hardened into rock). Mount Washburn, the highest point on the caldera north rim, is likely just the northern flank of a vast volcano that was deeply eroded, then mostly foundered into the Yellowstone caldera to the south. There was locally an unusual concentration of dikes and other intrusions that helped this part of the old volcano resist erosion. The college girls disappear around a bend. When I reach the bend, they are nowhere to be seen. Well, shucks. I hope I didn’t spook them; I like keeping someone in eyeshot while on the trail. The trail will take me up the near peak, then along a saddle to the more distant peak with the lookout station just visible. I look back after hiking a few more minutes. The college girls have reappeared about a hundred yards behind me. Fine with me; I’m more comfortable ahead of them than behind them anyway. Just so someone is in eyeshot. A family is up ahead looking into the woods above the trail. Must be wildlife. 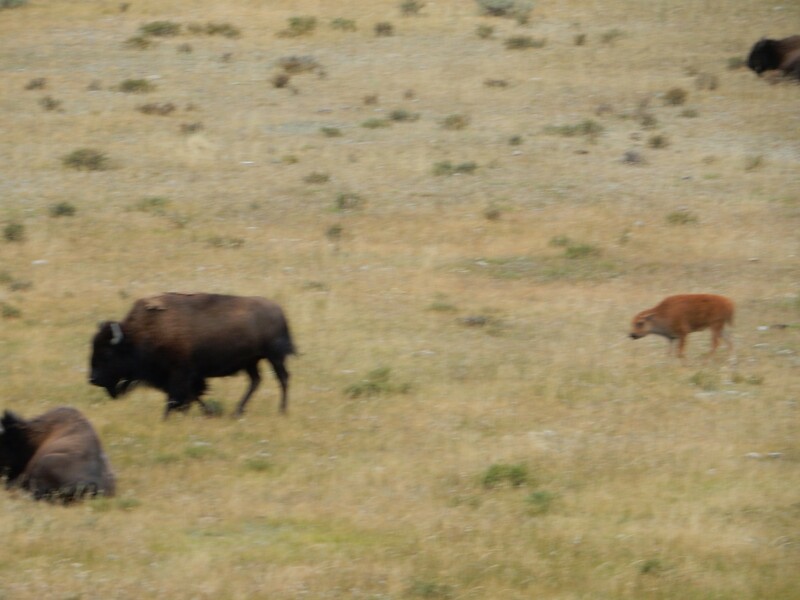 I have to look sharp, but, yeah, a small elk. I discover the two college girls are right behind me. “What are we looking at?” “Elk.” “Cool.” I hike on, now staying just a little ahead of the family. The trail seems more crowded now; good. Dikes in the cliffs ahead? Or just joints in the conglomerate. I reach the first peak. It’s an amazing view. I am still husbanding my camera batteries; I decide to wait and take photos here on the way back, if it seems warranted. But along the saddle, I see a dike that I know I want a photograph of. There is a young couple here. The woman is puzzled. “You’re facing the wrong way. The incredible view is that way.” I am not unaware of this, but I am saving my panorama for the very top of the mountain. She is good natured about it; in fact, they both seem likable. I loosely attach myself to them for the rest of the climb. There is another saddle near the top. Both the husband/boyfriend and I are curious and start up what appears to be a small trail. 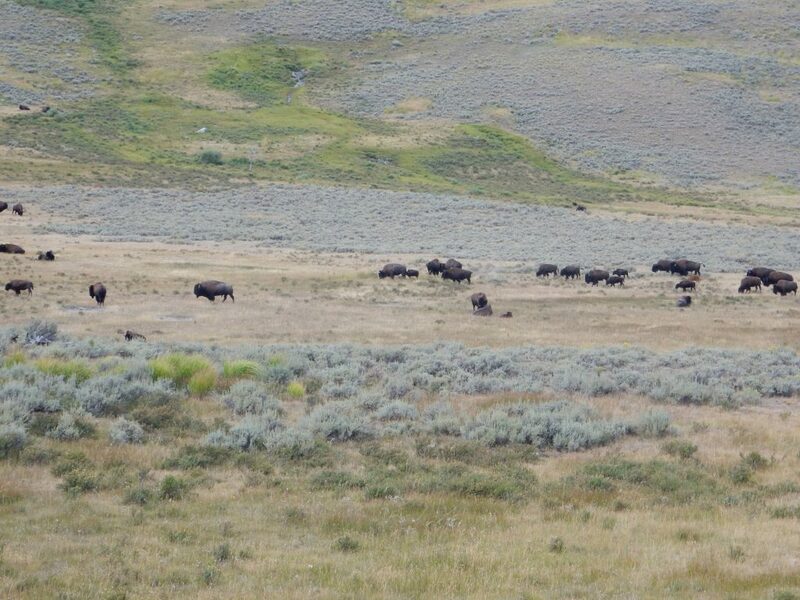 There is a sign: “Stay off the tundra; it’s delicate.” We come back. The wife says something snarky under her breath. I can’t hide a smile. “Oops, did I say that out loud?” she laughs. Really a likable couple. I reach the ranger station and climb onto the observation deck. A lot of low cloud has moved in, but the view is still wonderful. 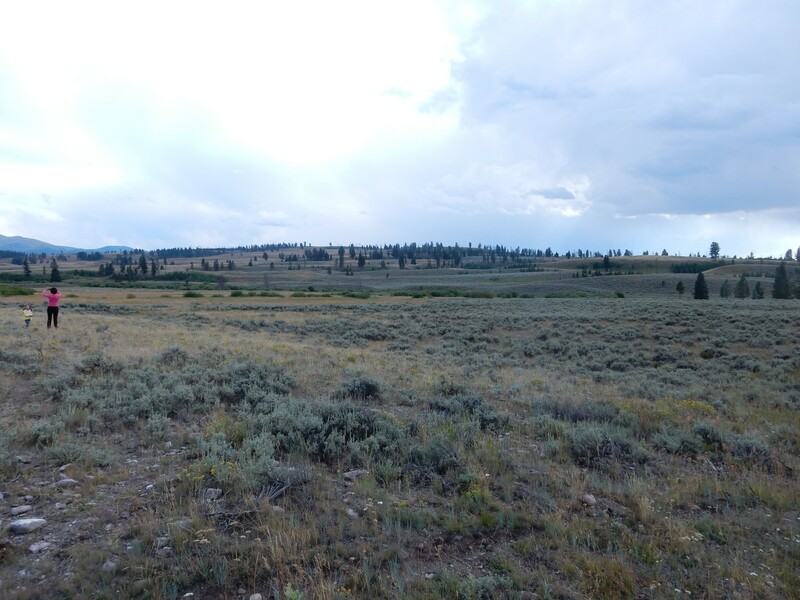 At left, to the southeast, you can see the Grand Canyon of Yellowstone in the middle distance, and beyond are the mountains marking the eastern limit of the caldera. 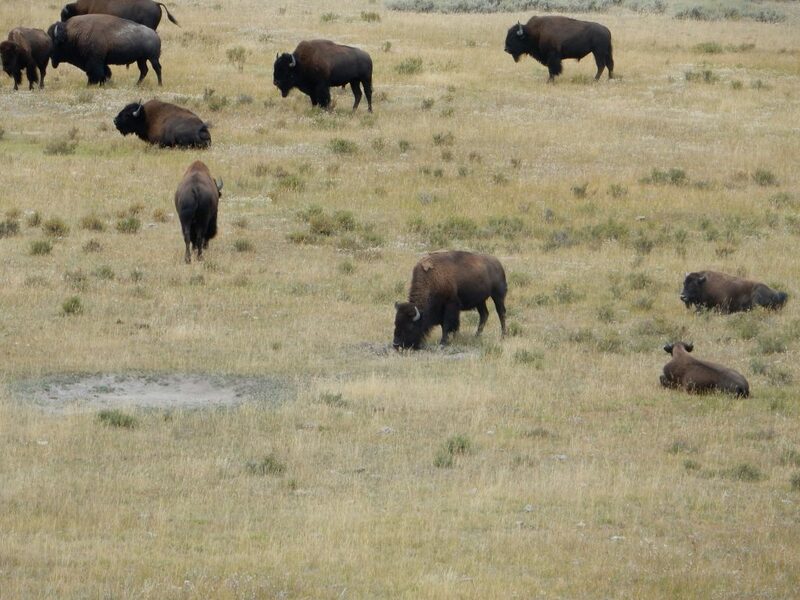 To the south is the Yellowstone Plateau, which you can see is remarkably flat. The Grand Tetons are barely visible in the far distance, while Mount Sheridan on the south rim of the caldera is a little clearer. To the west are more mountains along the north caldera rim, and, in the distance the Gallatin Range. Another panorama, from the southeast corner of the deck, showing the view to the east a little better. The boy and his father are German tourists. Seeing my tripod, the father asks me to take a picture of him and his son. (I get that a lot). I am delighted to do so, of course. The clouds start to break up a little, and I get a panorama to the northeast. We’re looking towards the Beartooth Uplift here, which occupies the northeast corner of the park and beyond. 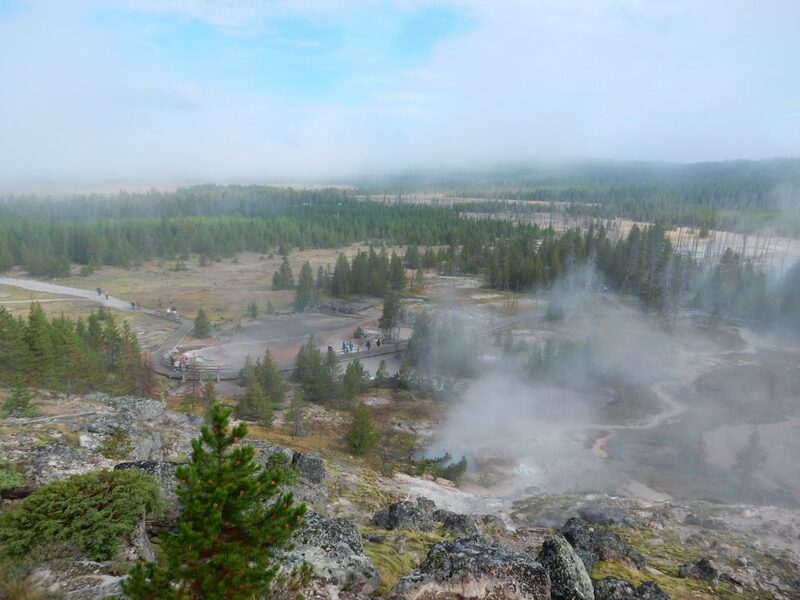 It was originally pushed up by the Laramide orogeny that formed the Rocky Mountains, probably around 30 million years ago, but has been pushed up further by the Yellowstone hot spot. It’s one part of the park I didn’t visit last time; I mean to drive out there tomorrow. I duck into the station and pull out my lunch. A pit stop. Back outside, I see that the college girls have made it to the top and are absorbed taking selfies. I descend, keeping a couple of German tourists in sight. I continue to husband my camera batteries, but decide I have to show whence I came. The highway over Dunraven Pass, at the head of the trail. I am tired after the climb (six miles round trip) and find myself stumbling a bit coming down. At one point I snag my toe on a rock and nearly go down. Shucks; that was awkward. 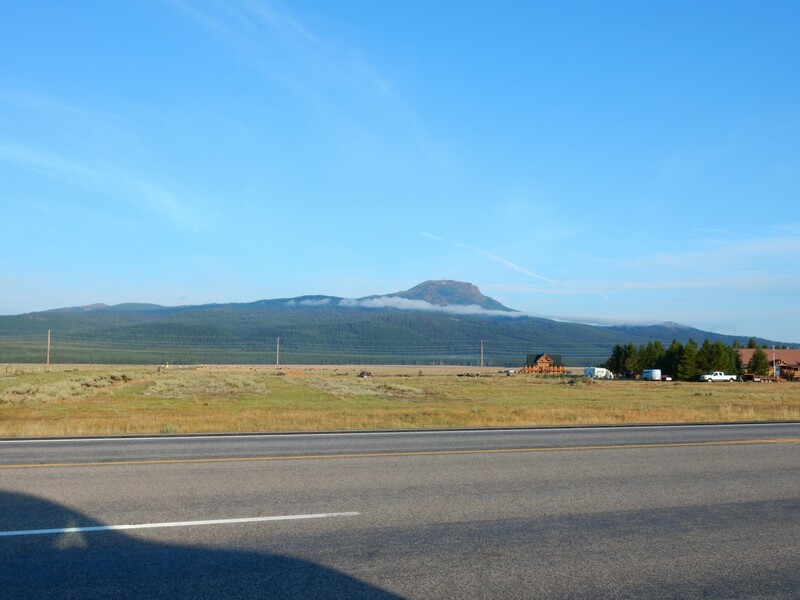 I drive down the other side of Mount Washburn and stop at the store at Tower Junction. 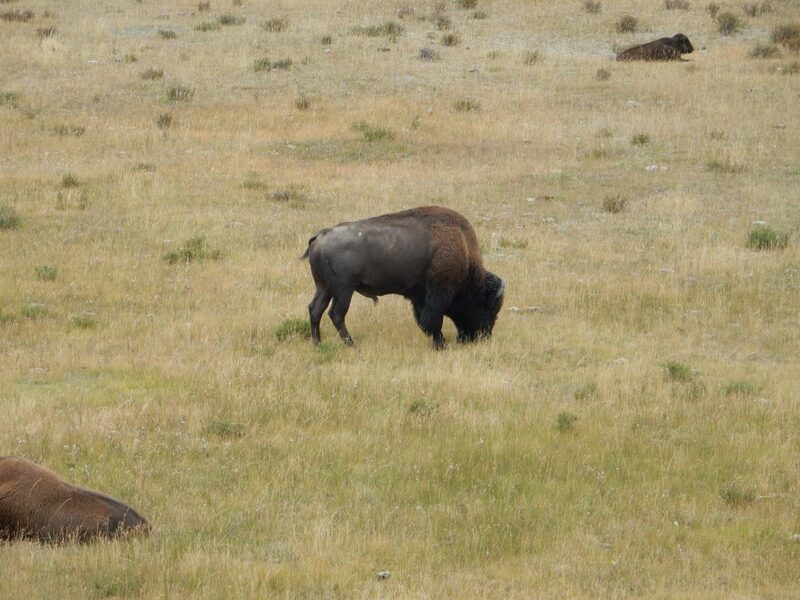 I find a good hiking map of Yellowstone and a strip of beef jerkey, and ask the proprietor if he knows anywhere I can plug into an outlet for a couple of hours. “Sure, no problem. Use this one or the one just ouside.” Splendid! I pull out my folding picnic chair, park it by the outlet on the side of the store, and enjoy an hour and a half of relaxing, reading my geology books, and chewing on jerky while my camera recharges. Problem solved. I go to get up. Cripes, what did I do to my knee? It hurts like the devil. I must have wrenched it when I stubbed my toe coming off Mount Washburn. Shucks and other comments. I was planning on doing a lot more hiking this trip. I decide I will not be hiking Purple Mountain tomorrow. In fact, I’m having some difficulty walking at all. Snow. 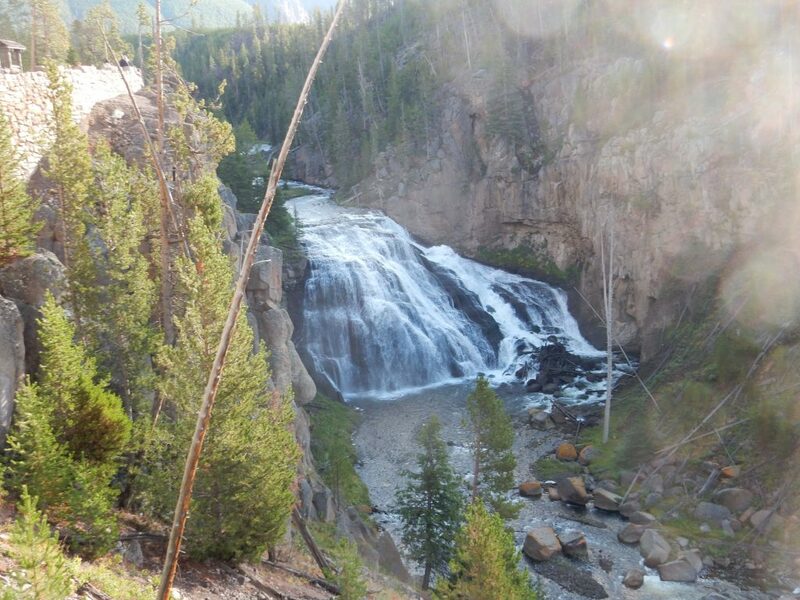 I do manage to limp up the short, tourist-thronged trail to the Tower Falls. This is a geologically interesting area, and I want a better view of it. I limp down another trail, but it goes nowhere; also painful. The knee is going to be a problem. Driving further up the road, I find a pullout with the view I am seeking. 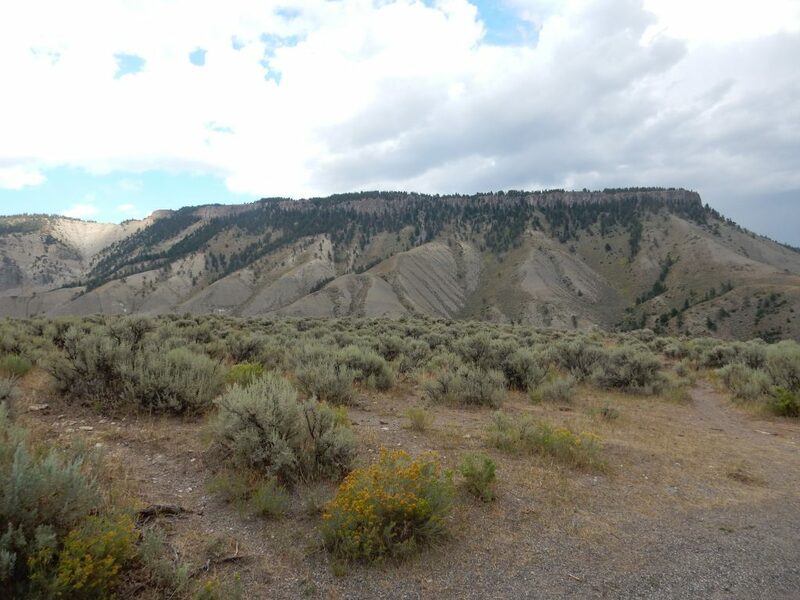 The lower part of the far canyon wall is volcanic conglomerate of the Sepulcher Formation, slightly younger than the Lamar River Formation but also part of the Absaroka Volcanic Supergroup. 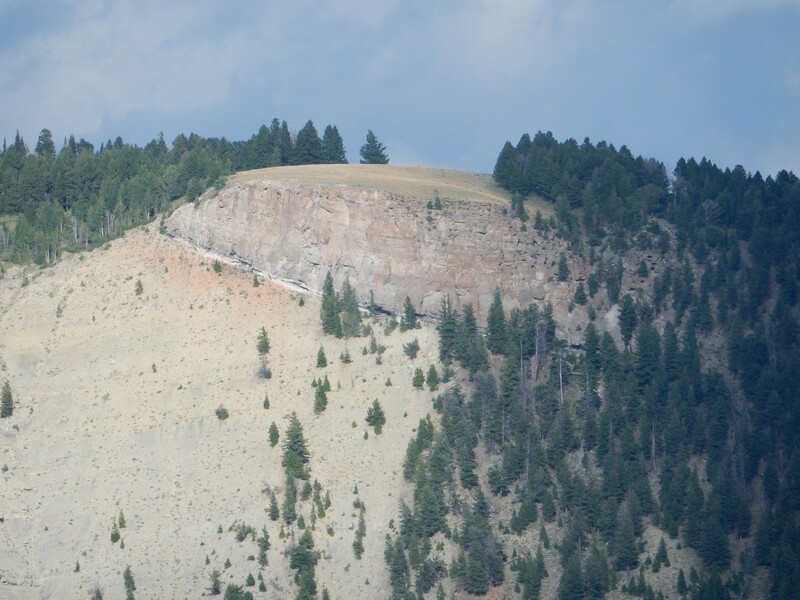 It had already been partially eroded by an ancestral Yellowstone River when lava came down the valley, producing the basalt flow visible above the brown conglomerate. and leaving a gravel bed between the two. River gravel then filled part of the valley before a second basalt flow came down the valley again, about 1.3 million years ago, forming the dark flow near the top of the valley. The very top is relatively young glacial debris. On the other side of the road is a somewhat older basalt flow. 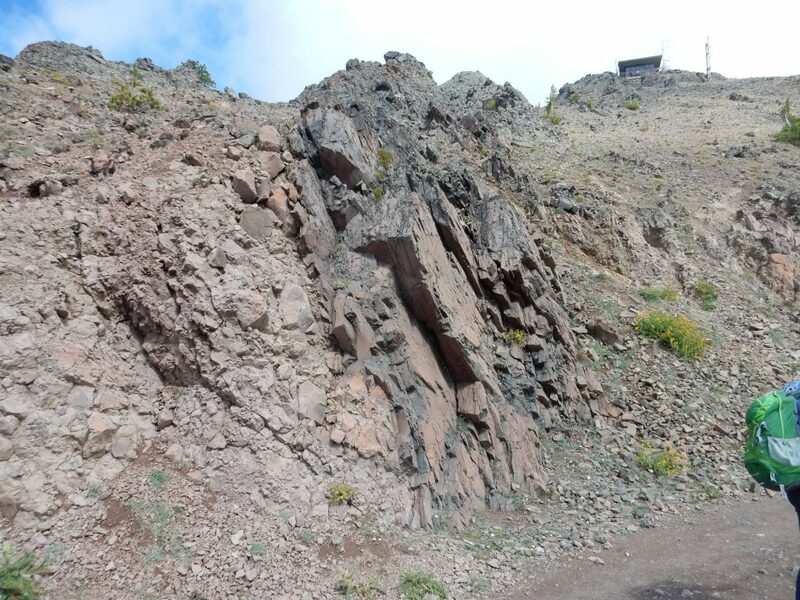 This is part of the Tower Junction Basalt, which erupted just before the first supervolcano eruption, the Huckleberry Ridge event, 2.2 million years ago. It just looms over the road. 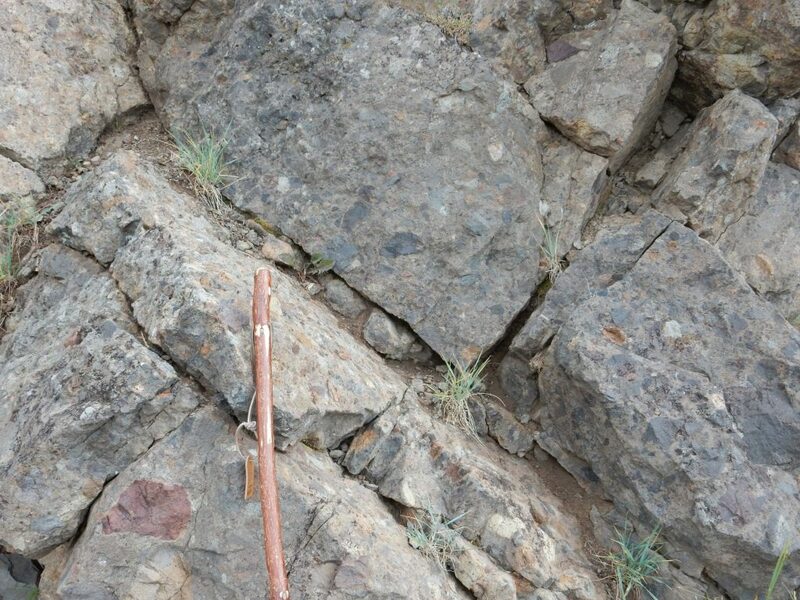 It is not uncommon for a thick basalt flow to cool into large columns at the bottom and be more irregular at top. Geologists use Greek temple architectural terms for this, calling the lower columns the colonnade and the irregular mass at top the entablature. I’ve seen few flows in which the colonnade is this thin and the entablature this massive; in the basalt flows near White Rock, they’re typically about equal in thickness, when present. A very nice view into the canyon further down. 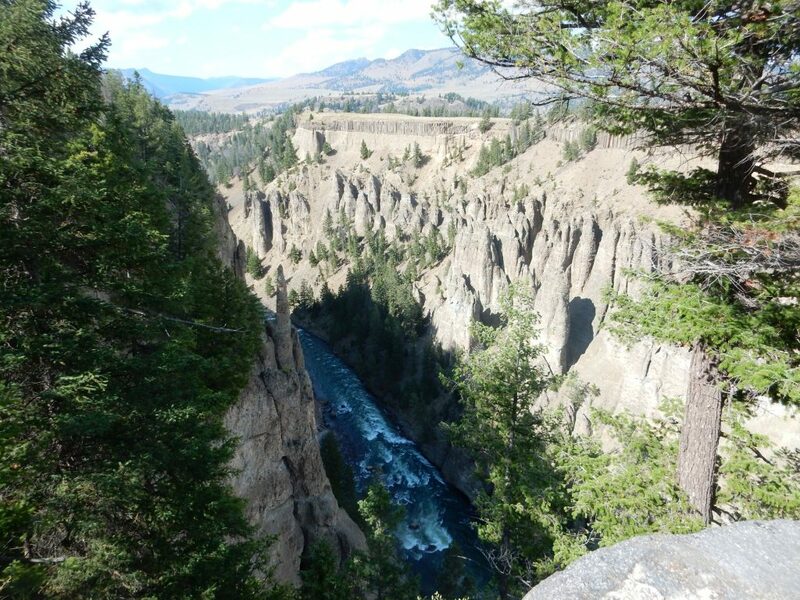 This is The Narrows of the Yellowstone River. 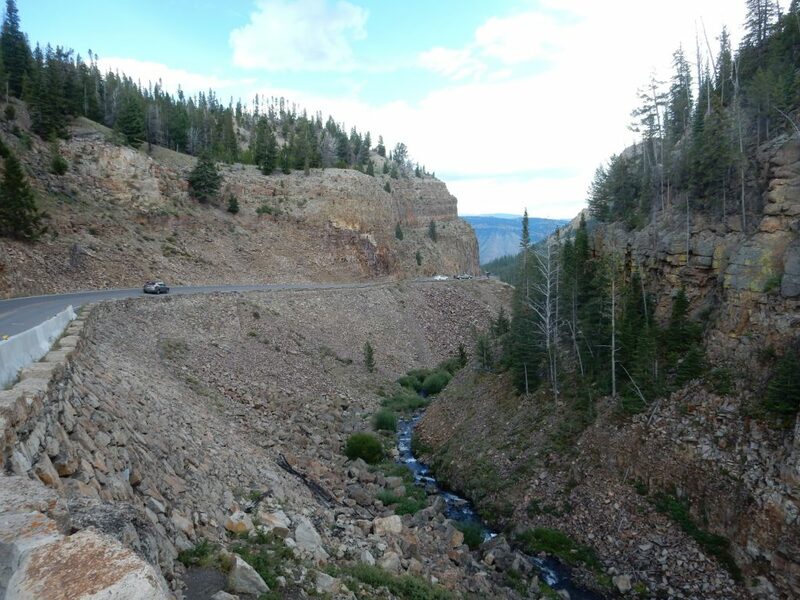 You can see that the lower flow across the canyon has pinched out, but the upper flow is exposed at the top of the canyon. A couple of German tourists are intent on something down in the canyon. I have to look sharp to see what it is. The parking lot was a madhouse; I settled for a distant shot from my car. This is the only remaining petrified stump from several that were in the area. The rest were removed by early tourists. The remaining stump is anatomically identical with the modern redwood. 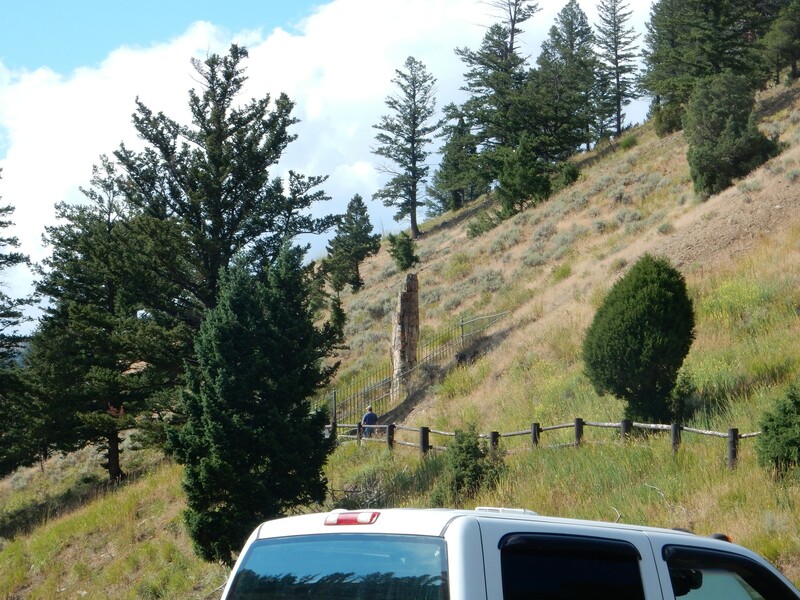 There is a great deal of petrified wood in the volcaniclastic beds of the Absaroka Volcanic Supergroup, including whole forests of stumps in some areas. The volcanic debris buried the forests, then the abundant silica in the volcanic debris was redeposited by groundwater in the wood. The formation in this immediate area is the Sepulcher Formation, which seems vaguely fitting. Driving towards Mammoth Hot Springs, I see what I take for river terraces. On reflection, I don’t think so. 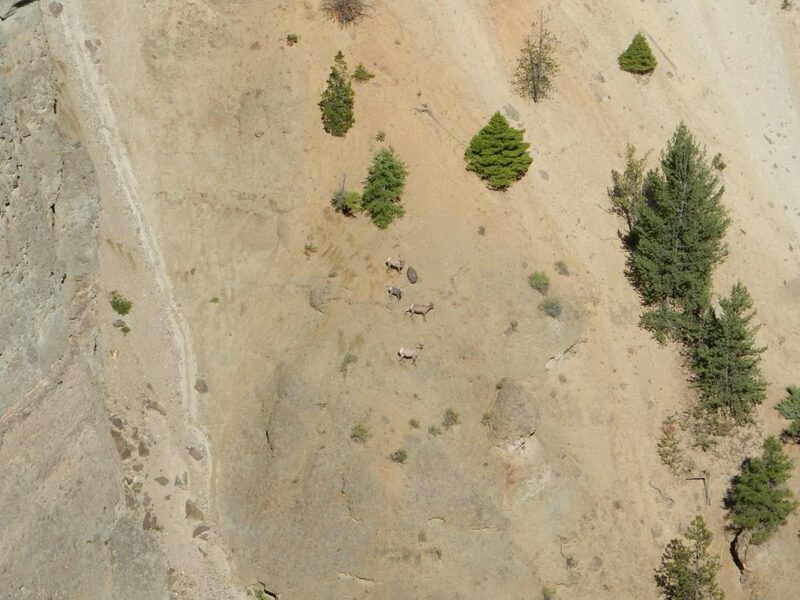 I think this is more likely landslide deposits, common in the northern part of the park. Another large knot of tourists along the road. I get out and look; bison. I wander out to the grassy knoll, wondering what conspiracy brings them all here. 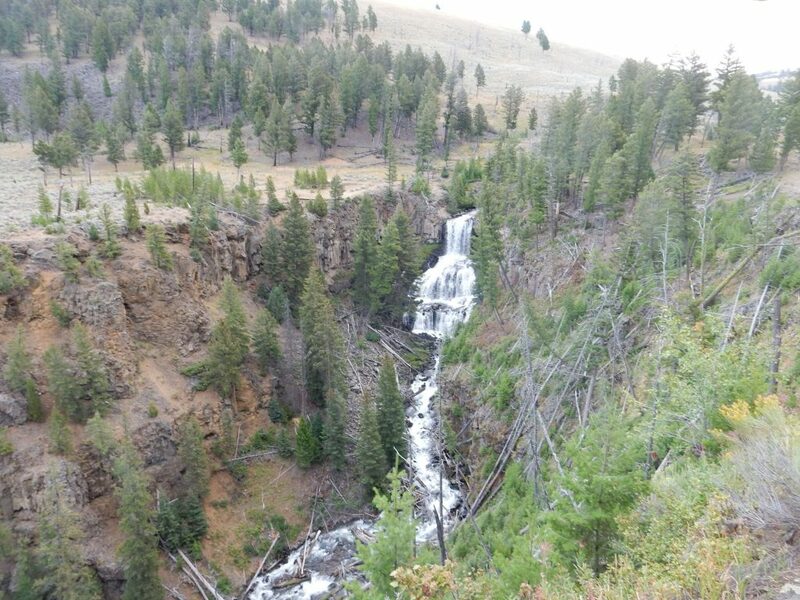 I stop briefly at Undine Falls. This cascades over several resistant flows of the Osprey Basalt, which was erupted shortly after the Lava Creek event 630,000 years ago. You can see some of the flow units further down the canyon. I count at least four cooling units here. I find myself south of Mount Everts. 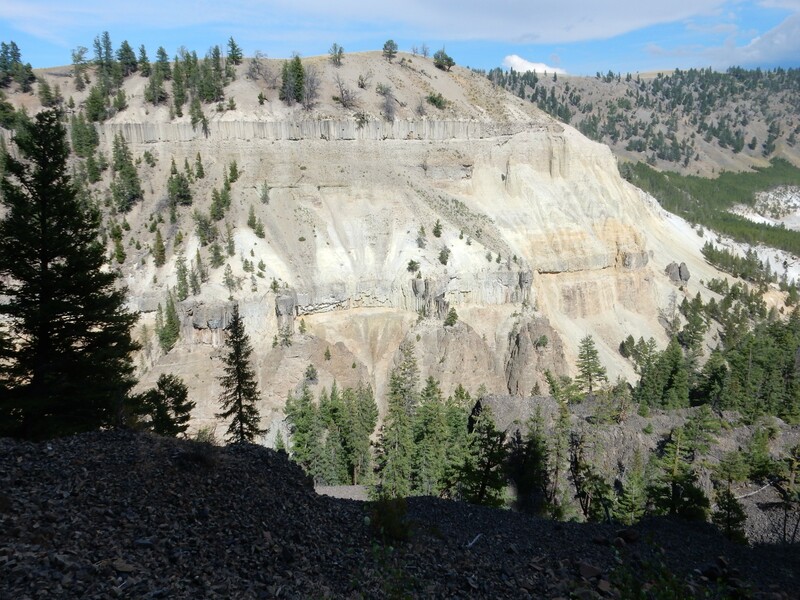 The bulk of Mount Everts is composed of lower Cretaceous sedimentary beds. My map lumps several formations together, but I have a wee bit of a hunch that the Everts Formation is one of the ones present here. 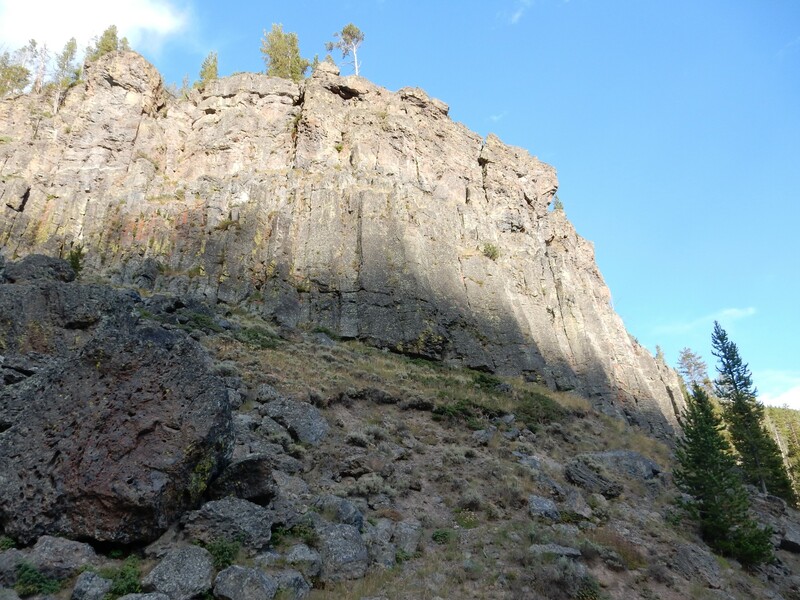 The caprock is Huckleberry Ridge Tuff from the first and largest Yellowstone super eruption. 2.2 million years ago, the top of Mount Everts was probably the bottom of a shallow river valley, which was drowned in pyroclastic flows of the Huckleberry Ridge Tuff. 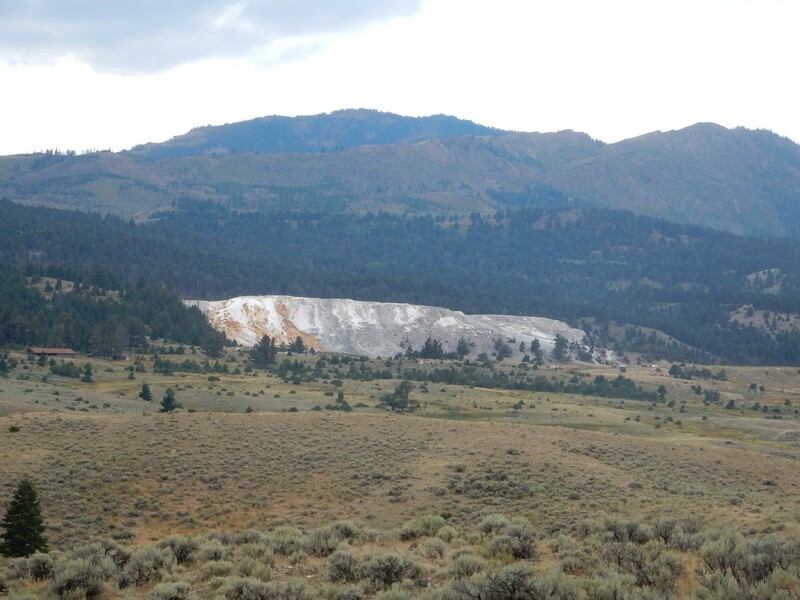 The hard tuff protected the soft sediments beneath, which elsewhere were subsequently deeply eroded by the Yellowstone River and its tributaries as the region was uplifted. This is a perfect example of inverted topography: Valleys have become mountains. 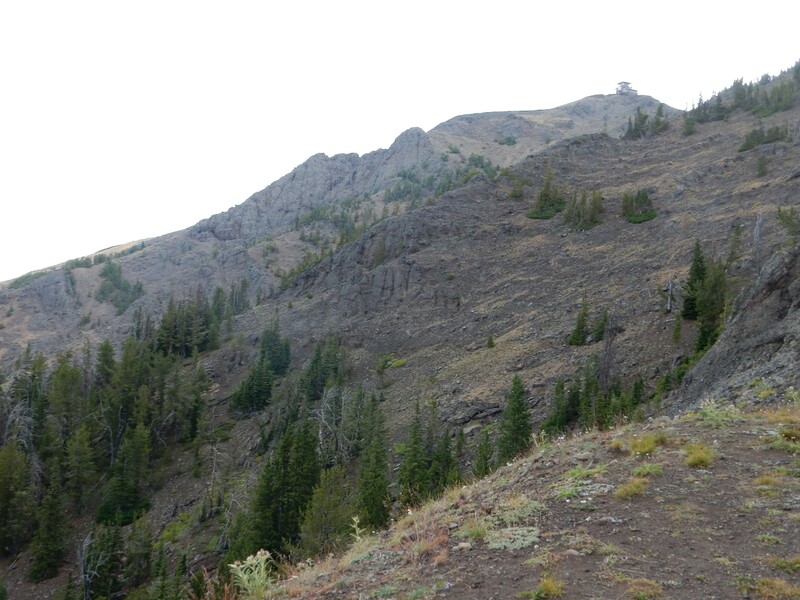 My map tells me that Lava Creek runs just beyond the foreground ridge here. Ironic given that there’s very little Lava Creek Tuff in the immediate area. Well, all right, there’s a fair amount around the creek further east. Looking southwest, I see the Golden Gate. 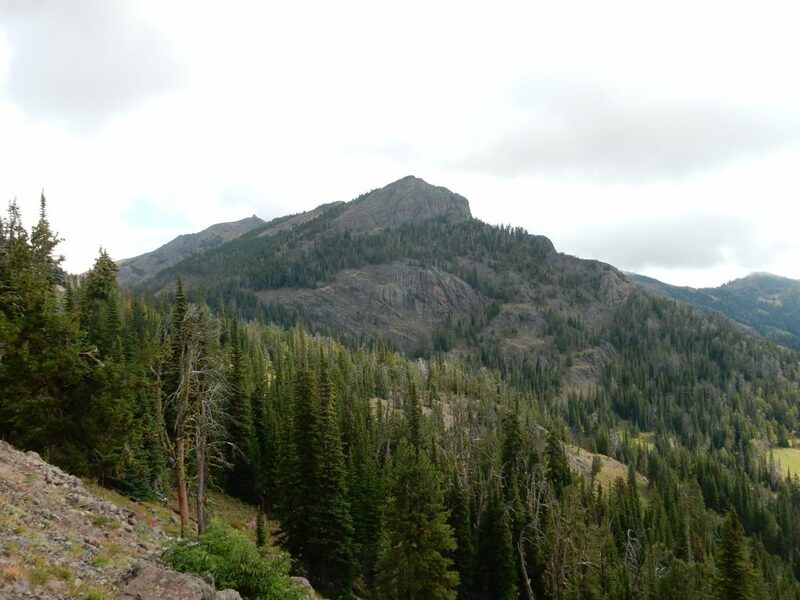 The peak is Bunsen Peak, a dome of dacite of the Absaroka Volcanic Supergroup. This likely represents a source vent. 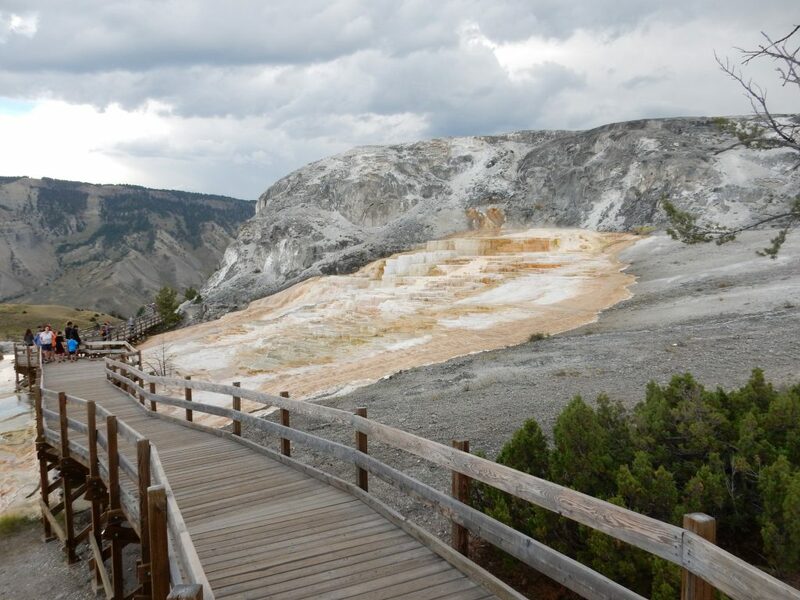 Across the valley is Mammoth Hot Springs. 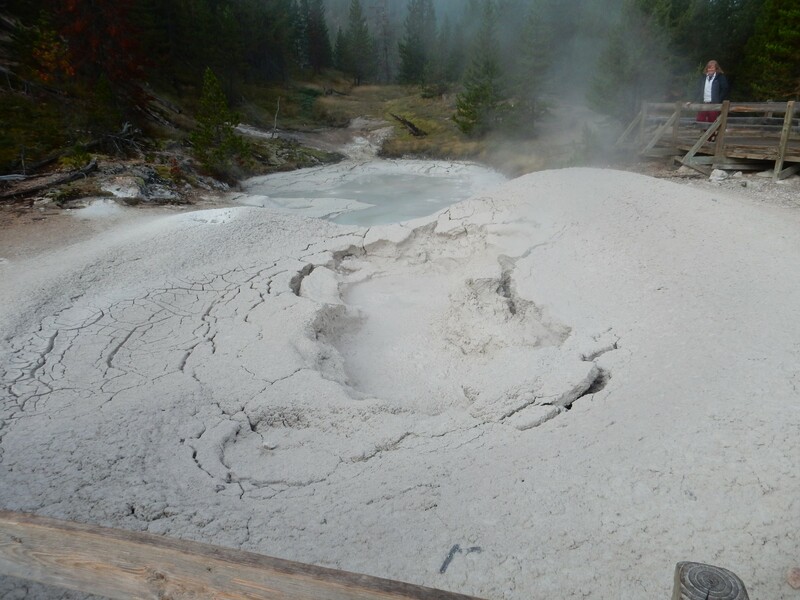 Behind the white travertine (hot spring limestone) of the springs is Sepulcher Mountain, underlain (naturally) by Sepulcher Formation. 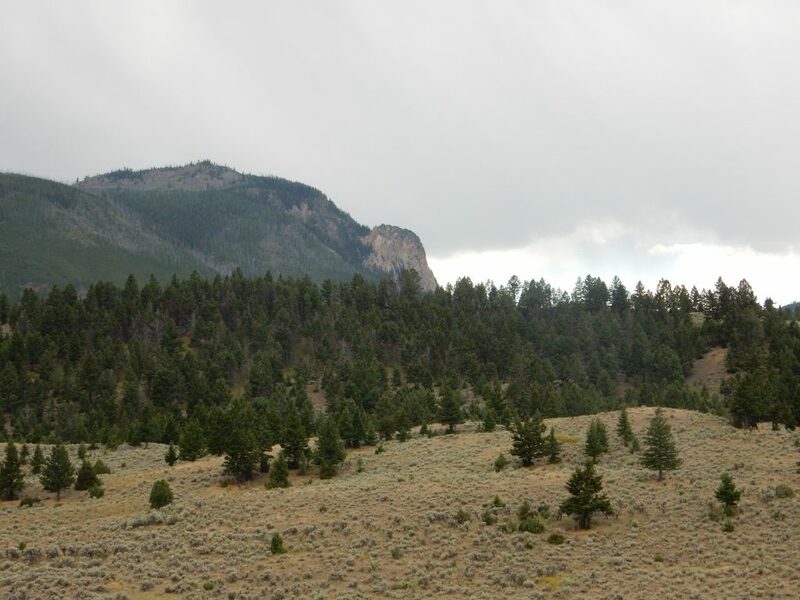 Peeking over the dark volcanic rock of Sepulcher Mountain is Electric Peak, which is underlain by Cretaceous beds similar to those of Mount Everts, but with numerous intruding dikes of the Absaroka Volcanic Supergroup. 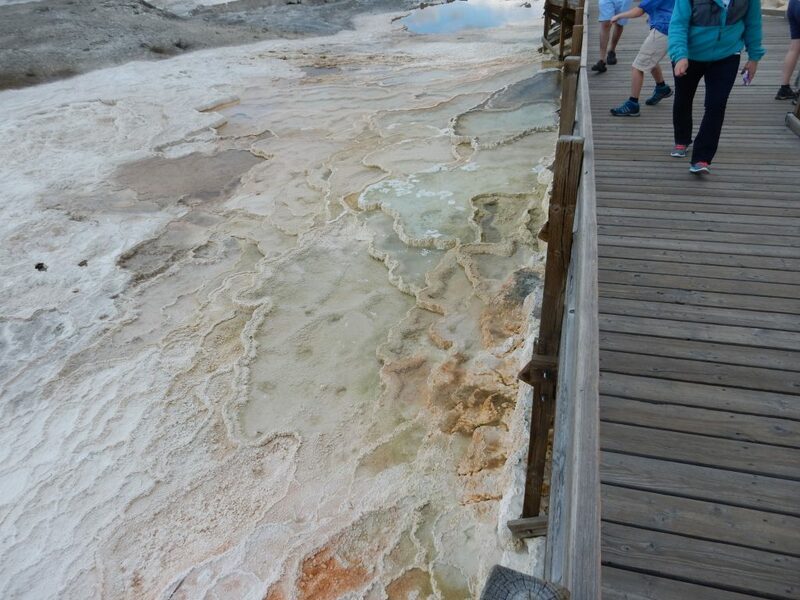 I turn in to Mammoth Hot Springs. It’s a madhouse, but I eventually find a parking space and limp off to see the springs. My knee does not feel good at all, but it’s not obviously getting worse, either. Mammoth Hot Springs is unique in that it is well north of the caldera and the deposits here are travertine (a form of calcite) rather than sinter (a form of silica). 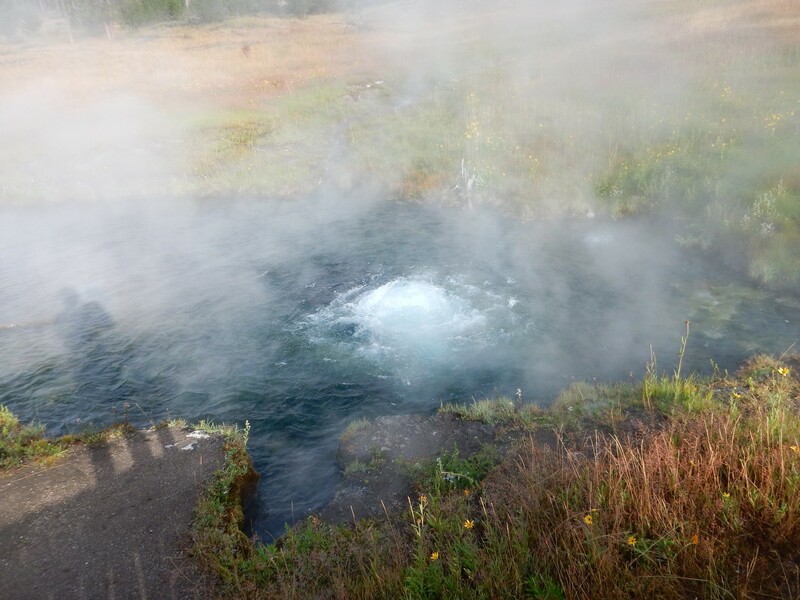 This is likely because there are numerous north-south faults carrying superheated water from the caldera, which passes through Paleozoic limestone beds deep underground as the water flows north. This produces some very pretty terraces. Mount Everts in the background. It occurred to me that I am standing on a high wooden platform in a light drizzle with thunder audible in the area; I rapidly descend. Up to now, it’s been a lot of German tourists. In this area, there are large numbers of Asian tourists. Stereotypes can be dangerous, but it seems like the Germans are fond of hiking in forested country, while the Japanese are fond of the thermal features and of wildlife. 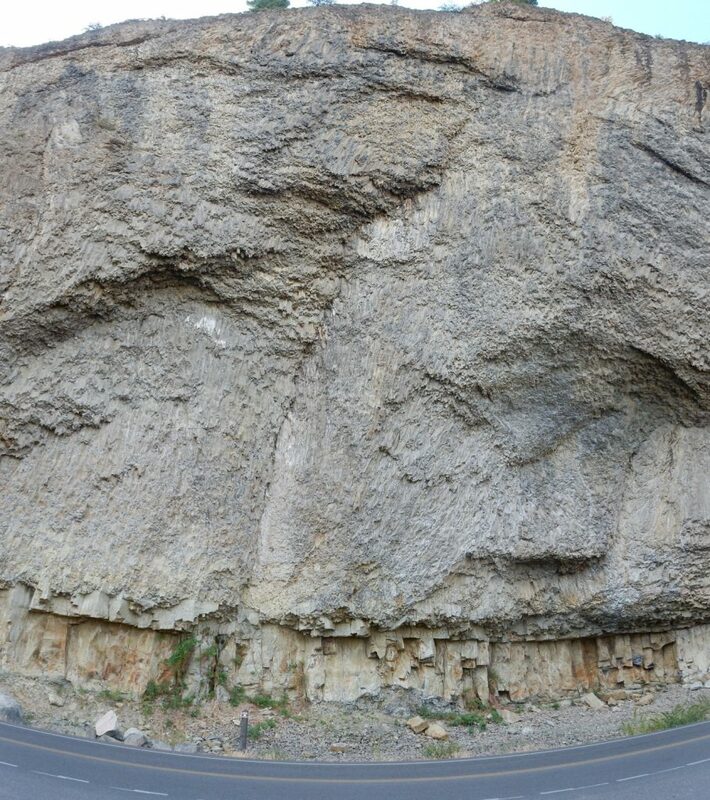 This is one of those outcrops that shows up in everyone’s book on the geology here. 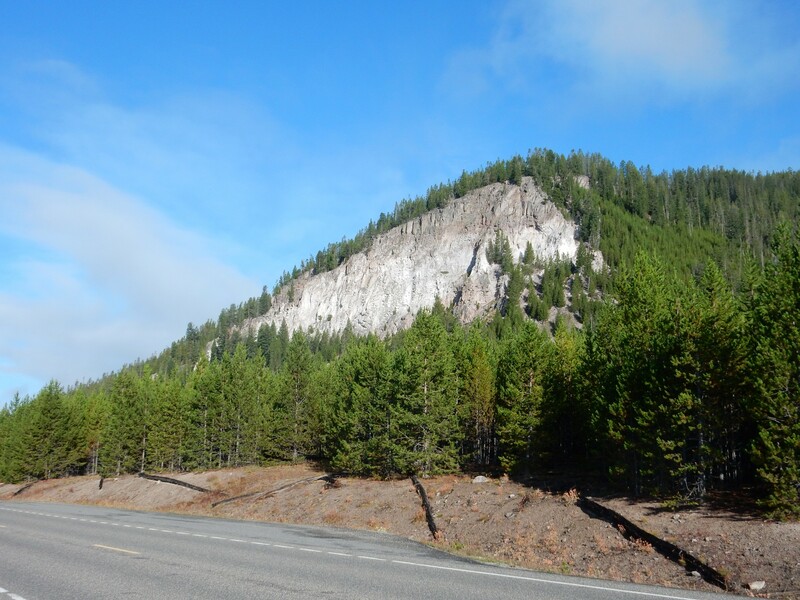 The mountain is capped with a thick bed of Huckleberry Ridge tuff. The white band beneath — which is actually around 8′ thick — is air fall ash that preceded the pyroclastic flows. About thirty feet of the Cretaceous sedimentary beds immediately below the ash bed have been “cooked” red by the heat of the ash and flow. It would be great fun, but very difficult, to hike up to this contact someday. Last time I was here, with Bruce Rabe, we fiddled with a telescope that was supposed to work with ordinary cameras to get great telephoto shots. We didn’t have much success. This time, the telephoto on my newer camera did a pretty decent job. I drive through the Golden Gate, and stop for a photograph of Bunsen Peak. Then I think: How can you drive through Golden Gate and not take a picture? Nor can I resist stopping at Sheepeaters Cliffs. 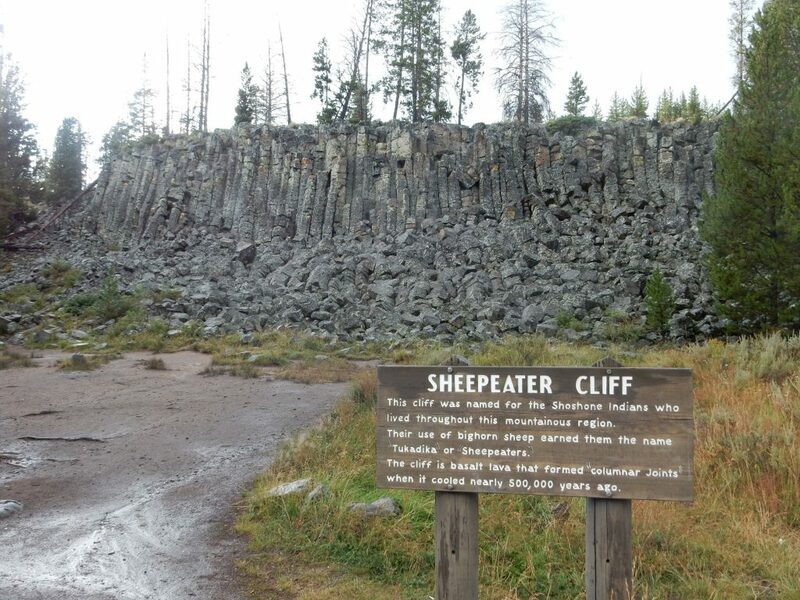 Sheepeater Cliffs are famous for their columnar jointing, with virtually no entablature. The basalt here erupted some time after the last super volcano eruption, since this flow sits on top of the Lava Creek tuff. It’s a curious but common feature of super volcanoes that their eruptions are either high in silica or low in silica; intermediate silica lava is rarely erupted. This is called bimodal volcanism. It’s true back home in the Jemez, where the most recent eruptions are the silica-poor Cerros del Rio and other peripheral basalts and the silica-rich Bandelier Tuff eruptions. “Peripheral basalts” may be a clue; the silica-rich magma forms in the center of the volcanic field and the silica-poor magma around its edges. There is an older woman standing in the parking area, arms folded, with an enigmatic Mona Lisa smile as she looks into the distance. Neither the smile nor the folded arms change as she turns her head in my direction. Just taking it all in? Waiting for her husband to return from splashing around in the river? Glad she’s amused, whatever it is that’s amusing her. 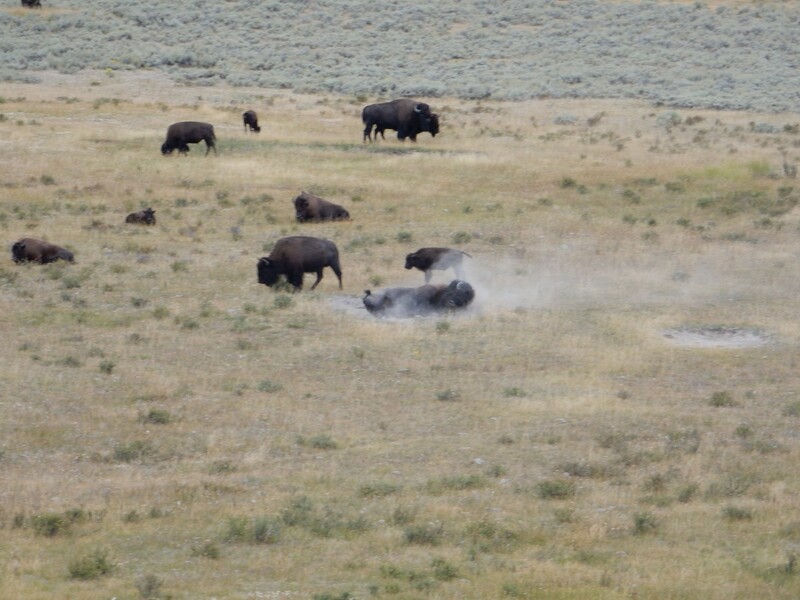 I head north, once again skipping Norris Geyser Field for the moment. I hit road construction; work is being done on the road between Norris and Madison Junction, and it’s down to one lane at the moment. Traffic stops as I’m under the Obsidian Cliffs and I take a shot. 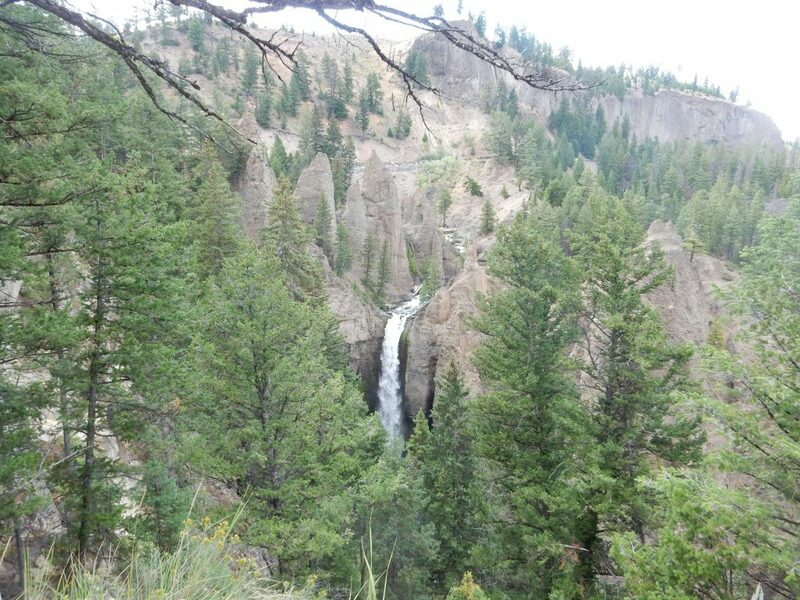 The Obsidian Cliffs are part of the Roaring Mountain Member of the Plateau Rhyolite. This formation spans a considerable age range, but all of it is younger than the last caldera eruption. Obsidian is formed from lava that is very high in silica and very low in dissolved water vapor; this makes for an extremely viscous lava that cannot sort itself into crystals as it cools. It solidifies to glass instead. Over time, obsidian devitrifies as it absorbs atmospheric moisture and slowly crystallizes; thus, very little obsidian is geologically old. The oldest obsidian I know of in the Jemez is the Rabbit Mountain obsidian, which is around 1.4 million years old. The cliffs here have mostly devitrified, but there are pockets of very pure obsidian that were prized by native Americans and more modern tourists alike. The cliffs are now off-limits to close access for this reason. I didn’t stop at the best spot for showing obsidian pockets (I didn’t choose my spot) but there is a small patch just visible in the cliff towards the right. The road construction eats up most of the rest of my daylight. I return to camp and turn in for the night, still worried about my wrenched knee. 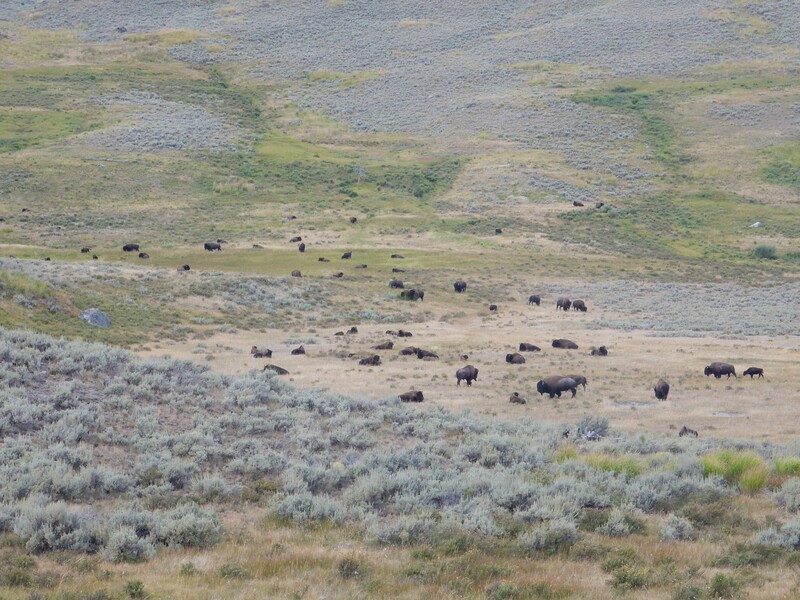 Next: Bison, petrified logs, and the Heart Mountain Detachment.